It is normally in one’s youth that one prefers rather pretentious novels, particularly if they are written in a beautiful and elaborate style, replete with quotations and abstruse references. How clever one thinks oneself to be in one’s late teens and early twenties, reading this sort of stuff before sneaking away for a quick perusal of thrillers or romances (to be disowned and despised). Later in life one finds those pretentious novels to be utterly dull and unworthy of attention. The one exception to this rule, in Tory Historian’s experience is Michael Innes (though not in his J. I. M. Stewart persona – there the rule applies in full). What seemed utterly dull and pretentious in those halcyon days of intellectualism has, for the last few years, appeared to be amusing and entertaining with quite interesting apercus. Ha, Tory Historian can do pretentious as well. A recently picked up novel is about the art world (they often are) and forgeries. Silence Observed is highly entertaining and has a remarkable summary of English life early on. John Appleby is now at the top of his profession in Scotland Yard as Commissioner of Metropolitan Police but still finds people approaching him informally about their problems in his club. There are levels of English society in which nearly all professional advice is picked up free. Cabinet ministers murmur their symptoms negligently into the ear of distinguished consultant physicians when the ladies have withdrawn from the dinner-table. Leading Queen’s Counsel know precisely what lies ahead of them when they find themselves on the right hand of brilliant and frequently dis-married hostesses. Top-ranking architects, summoned to indigestible feasts in ancient colleges, commonly take the precaution of bringing a junior staff with them and lodging them in an adjacent hotel. Tory Historian cannot help wondering how much that has changed, if at all. Tory Historian investigated the Cabinet War Rooms and Churchill Museum on Friday morning and a separate blog is called for that institution. 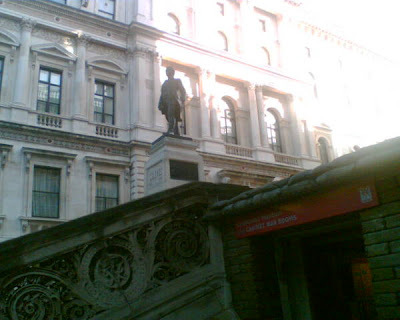 However, while waiting for a friend and lulled by the beautiful autumnal weather TH took this picture of Clive silhouetted against the Foreign Office. The next meeting will take place on November 3, at 6.30 in the Grimond Room, Portcullis House (that's the one that looks like a giant crematorium on the embankment). The speaker will be Ion Trewin, author of Alan Clark: the Biography. All are welcome but you may be encouraged to join the CHG. I return you many thanks for the honour you have done me; but Europe is not be saved by any single man. England has saved herself by her exertions, and will, I trust, save Europe by her example. Sadly for Pitt, the war on land was not going well enough for him to witness a victory. He died the following year. The IRA's bomb killed 5 people and injured many more. Its intent was to assassinate the Prime Minister and murder as many of the Cabinet as possible. Twenty-five years on the perpetrators are all out of prison and at least one (unrepentant) perpetrator was recently welcomed in the House of Commons, as Stephen Glover indignantly writes. The Battle of Hastings, which changed English history, was fought on October 14, 1066 with the Normans (who were not actually French but Norsemen) winning a decisive victory. King Harold II killed as the piece of the Bayeux Tapestry above shows. Here and here are some serious accounts of the battle, its causes and outcomes. Incidentally, it was not the last successful invasion of England. Henry Tudor invaded with a French army and some disaffected nobles to overthrow King Richard III in 1485. In the year 1066 occurred the other memorable date in English History, viz. William the Conquerer, Ten Sixty-Six. This is also called the Battle of Hastings, and when William I (1066) conquered England at the Battle of Senlac (Ten Sixty-six). When William the Conqueror landed he lay down on the beach and swallowed two mouthfuls of sand. This was his first conquering action and was in the South; later he ravaged the North as well. How can one better that? Tory Historian wishes Lady Thatcher, the most important and possibly the greatest British Prime Minister of the twentieth century (Churchill was a great war leader but pretty poor as politicians and something of a disaster as a peace-time Prime Minister), a very happy birthday. Today is the anniversary of the Battle of Lepanto, fought on October 7, 1571. The Holy League that somehow managed to come to an agreement had a fleet of 206 galleys and 6 galleasses, commanded by Don Juan of Austria, illegitimate son of Emperor Charles V and half-brother of Philip II. 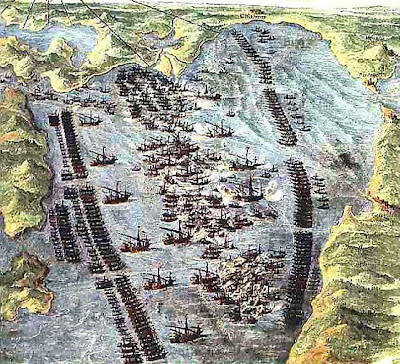 The Ottoman galleys were manned by 13,000 sailors and 34,000 soldiers. Ali Pasha (Turkish: "Kaptan-ı Derya Ali Paşa"), supported by the corsairs Chulouk Bey of Alexandria and Uluj Ali (Ulich Ali), commanded an Ottoman force of 222 war galleys, 56 galliots, and some smaller vessels. The Turks had skilled and experienced crews of sailors, but were somewhat deficient in their elite corps of Janissaries. Not only that, but they were less well armed and less experienced. The Ottomans had not lost a naval battle since the fifteenth century and was mourned throughout the empire as an act of Divine Will (not the best way of learning from experience). In Europe, particularly its Catholic part, this was seen as a hopeful sign: the Ottomans could be defeated and their retreat from Christian countries could now be envisaged. In actual fact, there was still some time to go. Tory Historian's first acquaintance with the battle came through the very fine poem, written by a man who may have considered himself to be a radical but was, in reality, a Tory in the truest and most old-fashioned sense of the word, G. K. Chesterton. Far it be from Tory Historian to suggest that these and others of his memorable lines could be studied with some profit by politicians nowadays. Aficionados of the classic detective story will recall that Patricia Wentworth's formidable heroine, Miss Silver, was inordinately fond of quoting Lord Tennyson's apposite phrases. After a long and ferocious civil war during which Mao frequently turned on his own followers if their support for him was not quite fervid enough, the Communists had won. Mao Zedong proclaims the founding of the People's Republic of China, arguably the most destructive, oppressive and murderous of the twentieth century's appalling regimes. The Daily Telegraph gives a timeline and mentions a few of the horrors associated with Mao's name. Tory Historian strongly recommends that readers turn to Jung Chang's books. For those who find the Mao biography a little daunting (that is almost all of us) there are the superb and harrowing Inspector Chen novels by Qui Xiaolong.